If you have a baby on the way or are a new mom, congratulations! It is one of the most beautiful milestones of a woman’s life. With a new addition to the family comes new responsibilities. Among those responsibilities is the obligation to take care of things financially. When I first became a mom, it completely changed the way I looked at my finances. I now had a little person to look after who was depending on me for everything. I had to quickly switch from a dependent mindset to a provider and allow my money management skills to follow suit. 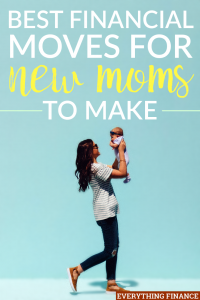 If you don’t want financial stress to weigh you down as a new mother, keep these important financial moves in mind so you can make them when the time is right. Long before you decided to have a child, you probably had financial goals that did not involve children. Do your best not to lose sight of those goals. Just because there is a new addition to your family, it does not mean you have to completely revamp your financial goals. You can still increase your net worth with the additional expenses of childcare. You can still go on vacations; though the destinations might change. Most important, you can still expand your education and gain new skills after becoming a mom. Your child will be a top priority, but you also need to find a healthy balance when it comes to reaching your goals as well. To stay on track with your financial goals with a new baby in the picture, consider creating a vision board. A vision board is a graphic depiction of your goals. Put it somewhere you can see it every day. The vision board should motivate you to find new ways to budget with the additional expenses coming your way. It should also give you the determination you need to achieve your goals. Kids grow quickly. The more things you can buy that grow with them, the better. This will save you money in the long run. A perfect example is strollers. There are strollers that are made for babies and toddlers. They come with car seats for babies. When you remove the car seat, the stroller converts into one for a toddler. In addition to considering gear that you will get plenty of use out of, try not to pay attention to fancy designer labels and certain pressures that society places on moms to clothe and supply their kids with expensive items. During the first few years, kids will go super fast and you may not even be able to make good use of all the fancy gear you purchase. Try to focus on spending time with your baby/child and cherishing each stage of growth they’re in instead. Find quality items used or on sale to get more bang for your buck. It is a good idea to plan for parental leave in advance. Know how many weeks your company pays for parental leave. For mothers, maternity leave is a time to bond with the baby during their first few weeks. More and more companies are offering paternity leave as well. If you are married, you may want to consider alternating when each of you takes leave. Maybe the mother uses all of her maternity leave first and then the father uses his paternity leave afterward. Although, some couples may want to take leave together. It’s up to you. If you don’t get a paid maternity leave, focus on building up your emergency fund before you have the baby. You can also try to pick up some low-effort home-based side hustles to bring in extra income while you stay at home with your baby like taking surveys online, testing out websites, or writing articles online. Between co-pays, co-insurance, and deductibles, health insurance can become expensive and confusing. Take some time to read through your paperwork and determine exactly how much of your upcoming healthcare costs you will be responsible for. Consider using a Dependent Care Flexible Spending Account to save some money on the healthcare costs for your child. If you have a Health Savings Account (HSA) that might be able to help you cover some of your medical bills. Whatever you do. Don’t ignore your medical bills. Talk to your provider and try to get on a payment plan for whatever your insurance won’t cover. When you get on a payment plan for medical debt, you can often make a flexible arrangement and won’t have to pay any interest. If you already have a will, you are steps ahead of most people. All you have to do is revise it to include your newborn. Consider all of your possessions and assets. What would you like to be passed down to your child in the event that you pass away prematurely? Most importantly, whom would you want to be your child’s guardian? If you do not already have a will, now is definitely the time to create one. You can use a service like LegalZoom to create your will online and appoint someone to settle your affairs. It is important to have a will to avoid unnecessary arguments among family members over your possessions and to avoid the court from having to choose a guardian for your child. You should also consider your options for life insurance now that you’re a parent. Term life insurance is very affordable and the younger you are the cheaper your premiums will be. If you are a parent, what are some smart financial decisions you’ve made for your family? If you plan to have a child in the future, what are doing to financially prepare for parenthood?